How many third string catchers hit 21 home runs in a season? That’s exactly what this Minneapolis native did in 1961, while playing behind both Elston Howard and Yogi Berra. In the 1961 Fall Classic, Blanchard blasted two home runs against the Reds in just ten total at-bats. He had been a three sport all-star in high school who could have attended the University of Minnesota on a basketball scholarship, but chose to play baseball instead. The Yankees gave him a $50,000 bonus to sign with them in 1951, which at the time was a huge amount of money. Having been an outfielder during his high school days, Blanchard entered a Yankee organization loaded with outfielders at every level. Since they gave him so much money to sign, New York decided to start him near the top, in triple A ball with their Kansas City affiliate. When he struggled there he was demoted to single A Binghamton, where he played even worse. It was right about this time that the Yankees got the idea to convert him to catcher, and that conversion began when Blanchard was again demoted during his first season in the minors, this time to the Class C Amsterdam Rugmakers, who used to play in my New York State hometown. The following year, he started to catch full time for the Yankees’ class C team in Joplin Missouri and banged 30 home runs and averaged .301. Just when he thought he was on his way, Uncle Sam called and Blanchard spent the next two years of his life in the US Army. 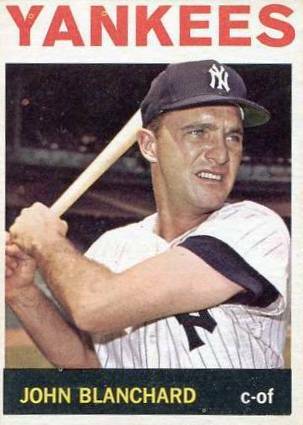 He made his Yankee debut during a brief 1955 cup-of-coffee preview and then was brought up for good in 1959. The problem was that when he finally reached the Bronx, both Yogi Berra and Elston Howard were doing his job just fine and Blanchard quickly became convinced that Yankee skipper Casey Stengel did not like him. He did however, appear in five games during New York’s 1960 World series defeat to Pittsburgh and averaged .455 in that Fall Classic. But it wasn’t until Ralph Houk took over the team in 1961 and made Berra his left fielder that Blanchard finally started seeing more game action. Johnny played seven seasons in all for the Yankees and got to the World Series five times. Nobody loved wearing the pinstripes more than this guy. I read an interview with Mel Stottlemyre not too long ago in which the former Yankee pitcher recalled the day during the 1965 season when he walked into the Yankee clubhouse before a game and found Blanchard crying inconsolably. The Yankees had just traded the catcher and pitcher Roland Sheldon to the A’s for catcher Doc Edwards. Blanchard had a good bat but a weak arm. Elston Howard had just been injured and put on the disabled list and the Yankees feared opposing teams would run crazy on Blanchard so they made the trade. Like everything else New York did during that 1965 season, Edwards turned out to be a bust. This popular Yankee died in March of 2009. Blanchard had been a big drinker during his Yankee days. In fact, one of his best friends on the Yankees had been Ryne Duren, who was hardly ever sober. Fortunately, after he retired, Blanchard realized his problem and kicked the habit. He became a successful salesman for printing companies. This pitcher who shares Blanchard’s birthday was the first ex Yankee to become a Texas Ranger. I’m not referring to the Texas Ranger baseball team, I mean the real Texas Rangers! This one-time Yankee first base prospect was also born on February 26.